Gingham is without a doubt a spring/summer classic, and is trending just as hard this spring as ever before. And it's a seasonal staple that I'm totally on board with. A gingham print is feminine, fun and just screams sunny-day-style to me. So when I found this beautiful Flynn Skye gingham set at one of my very favorite local Denver boutiques, Melrose & Madison, I knew I needed it in my spring wardrobe. Plus the best part is that, because it is a skirt and top set, it can be worn separately or together for multiple styling options. Obviously, I do love it together as a full set and think it's perfect for a spring/summer wedding guest ensemble, summer baby or wedding shower, vacation outfit or even a fancy warm-weather brunch. And I always love adding a pop of color to a b&w look so I added a bright pink strappy sandal to this look for an extra element of interest and color. 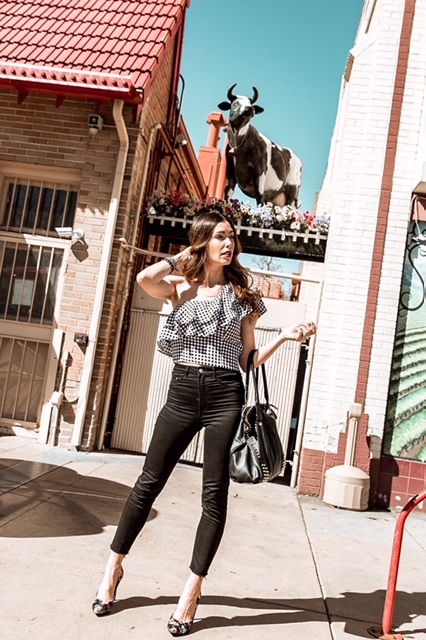 Next, I took the one-shoulder ruffle top and paired with black high-waisted jeans and floral print pumps (that I scored for a steal at Nordstrom Rack) to try out a little spring pattern-mixing. I feel like this look would be perfect for a brunch, date night, happy hour or girl's night out. You could also style the top with the same black jeans and a cute flat sandal or colored sneaker for a more dressed-down errand-running, coffee-date look. Finally, I loved styling this gingham maxi skirt with a cheeky graphic tee, black sock booties (these are from Target, but appear to be sold out so I've linked an almost identical pair here) and one of my favorite Lack of Color fedoras (linked a similar blue hat here) for an edgier, but still super-comfy spring outfit. Again, you could do this skirt and tee with a sneaker to make it extra easy and comfortable and perfect for running around town or meeting a friend for some shopping or a casual lunch date. This graphic tee is another fun Nordstrom Rack find by Suburban Riot, and if you haven't checked out their graphic tees yest, I really recommend it....they have some cool and ultra-fun ones. Of course, since we're talking about gingham, this set is not the only cute checked print I have in my closet currently. Absolutely can't forget about my Never a Wallflower Flutter Kick Skirt in a slightly larger scale gingham print. I am a little in love with the pencil skirt shape and dramatic ruffle hem and love it paired with a bow-detail top like this one and yet another pop-of-color pump (these are Topshop) for a timeless, feminine look that's still fun and on-trend. If you aren't familiar with my friend Dana's Never a Wallflower Designs, I encourage you to visit her site here or check out her IG page (@never_a_wallflower)....she is one of my besties and an amazing local Denver designer and I can't say enough good things about her or her line! So how do you all feel about gingham? Are you fans of a checked print and if so, how do you like to style it? Would love to hear if you have any gingham go-to pieces or looks so feel free to comment and share! Have an amazing week!